Sometimes you just want something easy for dinner. Something comforting and simple. Something you can just shovel in while you digest the day’s proceedings. 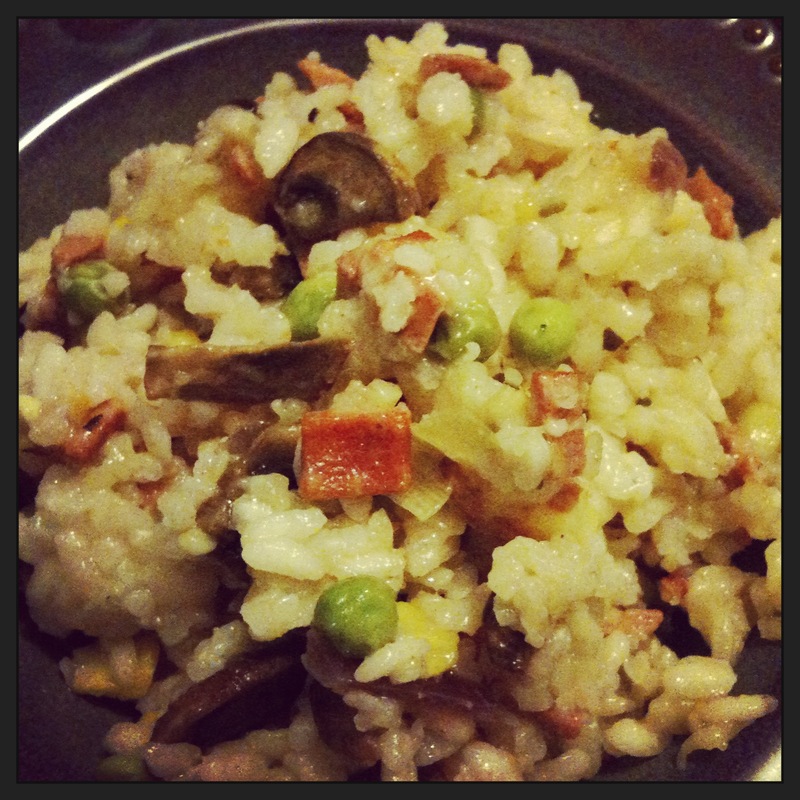 Risotto fits the bill. I actually enjoy making “proper” risotto – standing there stirring and adding stock, it’s cathartic and relaxing. But there are also times when I just want to chuck it all in the oven and let it sort itself out. Which is what you can do with this “cheat’s” recipe. Plus you can just add in whatever you have lying around the place or in the fridge. That’s what I do anyway. Now that’s the “basic” ingredients. To them, you can add whatever you feel like. I usually bung in some diced celery, baby peas, some chopped fake bacon, a few sundried tomatoes and some chopped mushrooms, grated cheese and chopped herbs. It’s all just meant to be spontaneous so don’t worry too much. It will taste yummy whatever you put in it. I’ve made one with just celery and peas, with some grated parmesan and it was delicious. Mix it all together in a large oven-proof dish (usually a shallow oblong or rectangle one – maybe a 6-8 cup capacity…) and cover it with foil. It doesn’t have to be a tight cover, it’s just to stop the top burning and the ingredients from drying out. Be careful while putting it in the oven – don’t spill it or drop half of it all over your slippers like I did last night. Gross! The oven should be on a fairly high temp – around 200 C. Bake for about 30 mins – you can check on it after about 15 mins and give it a stir if you like but I don’t always, it usually takes care of itself – risotto is done when all the rice is tender. Sometimes might take up to 45 minutes – it’s not an exact science but I usually find 30-35 minutess is enough. Serve with a nice grating of parmesan or whatever cheese you like. Voila! A good dish to make if you don’t like cooking but you somehow managed to invite someone over for dinner. This recipe is enough for about 6 people or 4 piggies. It’s Friday night and all I can say is TGIF!!! It’s been a long, exhausting week. I’ve been in horrible pain with my back and neck and I just want to strap heat packs and hot water bottles to every muscle in my body and lie down for two days straight. Will have to make do with just a couple of hours probably.